Adding a simple piece of wire to your walkie-talkie could double its range. Some things in life you can never have too much of. But for this article, we’ll concentrate just on radio range/efficiency! There are many ways to boost the range of your two-way radios. We write about this topic regularly (please see our complete section on communication related topics to access these articles) and basically, the suggestions we offer fall into one of two categories – either getting a more powerful radio transmitter and more sensitive radio receiver, or boosting the effectiveness of your antenna. Between these two choices, improving the effectiveness of your antenna is always the better approach. More powerful transmitters and more sensitive receivers are, of course, more expensive than standard grade units, and a more powerful transmitter is also going to need much more power to operate – chewing through batteries maybe ten times faster, and/or becoming a power-hog when you’re off-grid and power is precious and limited. One more important issue – the more powerful your signal, the further it goes, and the greater the number of people who might receive it. This is seldom a good thing, particularly when you are trying to keep a low profile. This is why our focus is not just on greater transmitting power, but also on better overall efficiency of the antenna so it can receive weaker signals more clearly, and – with our radios – if we improve our antenna, we often then cut back on our transmit power, keeping it at the minimum needed for the range we require. Enough introduction. By now, you’re probably keen to understand the 10¢ device and how it can double your radio range. Actually, we may have misstated the truth – the device might cost you less than 10¢! This device is simply a piece of wire which dangles down off your hand-held radio transceiver. That sounds too good to be true, doesn’t it, and a bit like the ‘patch’ devices that used to be sold to gullible fools to add to their cell phones, with claims either that they would magically filter out harmful radiation or boost the phone’s range or something. But we’re not trying to sell you anything, and there is actual solid radio theory that readily explains how and why this works as it does. And, most of all, you will actually perceive the great boost to your radio’s signal yourself – you will know if it works or doesn’t work. Without going too much into the theory, but also giving you enough to understand that this is a bona fide scientific real thing, most antennas need two parts in order to work properly. Sometimes the two parts are obscured as part of a single overall antenna structure, but any good antenna definitely does have two parts to it. However, with a hand-held transceiver (HT) the people who design them have pretty much unanimously decided that people prefer small portable robust units rather than larger, bulkier, and more fragile units. They have taken that perception and used it to justify making the antennas small and inadequate. They know the antenna is inefficient, but it is also small and strong, and they feel that is more important to most people, most of the time, than is a bulkier more fragile antenna but with better range (and with removable/replaceable antennas, if you do want/need a better antenna, you can simply buy one, as most of us do). The manufacturers are probably correct in their assumption, and most of the time, we accept the limited performance we get from our HT antennas – but sometimes we need better performance, and that’s what this article is all about. We explain this so you understand the answer to the question ‘If this is so great, how come it isn’t already being offered on all radios?’. To be more technically precise, the antenna on most hand-helds is typically some type of quarter-wave monopole radiator, usually inductively loaded to shorten its physical length while preserving its electrical length, most commonly a normal-mode helix. Adding this extra piece of wire changes it to a half-wave dipole. You already know that the first thing you should do with any HT is to replace its standard ‘rubber ducky’ stub antenna with a better antenna, with ‘better’ being in part synonymous with longer/bigger. See our two-part article about adding an external antenna to your HT, and if you have one of the lovely little Baofeng UV-5R or the newer Baofeng F8HP radios (see our commentary about why either of these are usually your best compromise choice here) then you’ll see on this page the first thing we recommend you do to optimize the Baofeng is adding a specific improved antenna (the Nagoya 701 , costing a mere $6 or so on Amazon). But even these improved antennas are still massively inadequate because they don’t provide some type of radiating element for both halves of the antenna. Instead, the radio designers use various compromises in their design that basically end up as using your body as the other (‘ground’) half of the antenna system. You’ll be unsurprised to learn that the human body, while wonderful in many ways, is not very good at doing double duty as a radio antenna! So, to address this limitation, you can add the missing other half of the antenna to the radio yourself. All it needs to be is a specific length of ordinary wire (bell wire or phone wire, ideally multi-strand so it is flexible, and insulated). For 2M, this would be about 19.5″, for 1.25M, it would be 11.5″, and for 70cm, it would be about 6.5″. For best results, you want to strip the insulation off a short piece of the wire and then connect the exposed wire to the ‘ground’ or outside part of the antenna connector. This is very easily done with the Baofeng units – just unscrew the antenna sufficiently to be able to poke in the wire then screw down the antenna again to secure it. It might help if you break off/file down/drill a bit off the side of the plastic shroud surrounding the antenna mounting screw, making it easier to get the wire in and firmly clamped by then antenna. You can also use various types of washers or electrical clamps and connectors to create a connection too, depending on how much work you want to put into this enhancement. Once you have connected your wire, just let it hang down freely while using the HT. Don’t grip the wire when holding the HT, but let the wire hang down separately. When the radio is not in use, you can wind the wire around the set or do whatever else you like to store it conveniently. What Sort of Improvement Will You Get? But on 2M, you can expect your signal strength to increase by perhaps 6dB. Some hams report as much as a 9dB improvement, but we find that improbable. A 6dB improvement is the same as increasing your transmitting power four-fold, so it is a huge/massive improvement, and truly could double your range – or could now allow you to reduce your transmitting power while still getting a signal out as far as before, and getting a greatly improved receive signal. Now for an interesting extra point. Not only do you not always need to boost your transmit and receive capabilities, but sometimes this can be inappropriate. Sure, you can maybe offset a more efficient antenna by reducing your transmit power, but if you are already receiving very strong incoming signals, and particularly if you have some unwanted signals on nearby frequencies, boosting the signal from the antenna to the receiver can sometimes cause problems. If you find, after adding this extra wire to your HT, that it actually receives more poorly than before, even though it is transmitting better, you have a problem with your receiver circuitry being de-sensitized by strong adjacent signals, and in such a case, you should stop boosting your antenna. For this reason, there is another way you could conveniently control your antenna, making it easier to selectively add or remove the extra wire. Have just a short lug connected to the antenna ‘ground’ base on the HT, and protruding slightly from the radio. Then if you need a boost in capabilities, you can conveniently clip whichever antenna you want onto the radio, but if your receiver is being overloaded, you can unclip it again without any great hassle or bother. First, if you use your HT on more than one band, you will need different length wires for each band (19.5″, 11.5″ and 6.5″ for the common 2M, 1.25M and 70cm bands). If you regularly switch bands, what you might want to do is have the 6.5″ wire mounted permanently, and keep two extender lengths, 5″ and 13″, then if you switch bands from 70cm, you connect the extender onto the bottom of the 6.5″ wire. Note that the connection needs to be electrical, not just physical. There are easy and complex ways of doing this – the easiest is stripping a bit of insulation off the end of the 6.5″ wire and off one end of the two extender wires, then simply twisting the two together. Slightly more elegant would be to have an alligator clip on the extender wire, and more elegant still would be to have a paired socket and plug connector at the end of each wire. Second, you don’t actually need to have your antenna wire physically connected to the ground of the main antenna at all. You will get best results if it is connected, but if that is difficult – or if it is impossible, for example, with a radio that has a fixed antenna that you can’t unscrew to access its ground – you can create a capacitive coupling between the radio and your antenna, by simply terminating your wire in a metal path (tin foil or copper or whatever) and affixing the patch somewhere on the radio. The bigger the patch size, the better, and some locations will work better than others. Some trial and error experimentation might be called for to work out the best place to place the patch. Of course you could also open up the radio casing and hard wire/solder the wire to a ground point on the radio’s circuit board or access the antenna’s connector internally, then have the wire coming out through a hole in the case, and that would be slightly better than the capacitive coupled device, but is more hassle. Third, some people have chosen to connect the extra wire to the antenna’s connector rather than to the radio. There’s no reason not to do this, and if you don’t want to do anything to your radio, and/or if it is easier to add the extra wire to the antenna’s connector rather than to the radio’s connector, that’s an equally fine solution. Lastly, if you’re still not convinced about how a simple piece of wire can add so amazingly to your radio’s range, Google ‘tiger tail antenna’ to see many credible articles confirming it works. But, really, you don’t need to do this, because it only costs you 10¢ and only takes you five minutes to do it yourself. You’ll hear the difference, as will the people you’re communicating with. And surely that’s what counts. Could you post the formula so I can figure out the optimal length for different frequencies? I’m interested in the length for my Yeasu HT that also has 6 meters. I assume the difference in length for GMRS & MURS is only one quarter to a half inch different from 2 meters & 70 CM which probably really doesn’t make much difference? Yes, the two products are similar. The Rat Tail is capacitively coupled, and has a nice little LED to show RF signal strength so you can guess at a good place to locate, but at $32, it is very expensive for what you get and most of us would prefer not to spend more than the 10c my method requires! The formula is simple. Divide 300 by the frequency in MHz and that gives you the length of a full wavelength in meters. Divide that by four to get a quarter wavelength in meters, and multiply by 39.37 to get the same in inches. If you wanted to be obsessively exact, you could then reduce the length by a few percent to adjust for the velocity factor of the wire you’re using, but the lengths aren’t all that critical anyway. So, yes to your question about GMRS/MURS. Thanks for the formula. I was going to try and rig something up using a solderless electrical ring connector this evening with male/female connectors on the ends so I can use it for the UV-5R on both bands. Unfortunately the ones I had were going to require both interior and exterior grinding/dremel work to fit over the reverse SMA attachment. It was more effort than I wanted to put into it. Did you make one of these for your UV-5R? If so how did you build yours, just a wire as you describe in the article or something more formal like I was trying to do? I surely did ‘make’ one for my UV-5R sets, but all I did was notch out some of the plastic surrounding where the antenna screws in, and shoved a stripped wire in. I don’t really ‘need’ the extra boost it gives me at present, but if I was going to use it longer term, I’ve an interesting suggestion for you which I just now checked. The four screws on the back of the UV-5R all connect to the antenna ground. The easiest way to connect a wire more permanently would be to one of those screws. Thanks for the info, that will make it so much easier. I believe the Diamond antenna I have on my FT-60 is 1/2 wave on 70cm & the one for my VX-7R is 5/8 wave on 70cm. Should I make the wires longer to match the 1/2 & 5/8 wave lengths for those two radios on 70cm or does it even matter in the big scheme of things for an HT if the antenna is balanced or not? That’s because it’s such great stuff! I’ve been prepping for about 6 years but the radio portion is all new to me so I’ve MUCH to learn there…and you’re doing a good job educating me. I’ve been forwarding links to your articles to my family and friends who prep and who took the HAM license exam with me…but as you know it’s hard to get most people to participate or take an interest in things other than Dancing With The Stars, American Idol, MLB, the NFL or the NBA. I’m looking forward to your upcoming article on setting up a repeater as I’d like to set up one for GMRS. Thanks for the field expedient formula Rick. A quick point of info for those of you who are considering making this counterpoise for a multi=band HT: since this is the ground side, if it is at least as long as the length needed for the lowest frequency you are covered, it can even be a bit longer, remember, this is the ground, not the radiator. One of the problems using an HT is we tend to forget things we learned due ti the convenience of the hand held. Dave – Another fine job! Please; keep ’em comin’. I plan to take your suggestion and add a length of wire to my UV-5R, which constitutes my backup comm for use during emergencies. I have one channel set on GMRS for this purpose. My problem is, I can’t discern what band that channel uses. I have researched my literature without success. I may well be staring right at the answer and not seeing it. Could you please steer me in the right direction and tell me where to look? That’s a good question, and, happily, we’ve already answered it. Much of the way down this article you’ll see the exact frequencies for all the GMRS channels. In other words, stick with the length of wire you use for the amateur 70cm band, it is close enough. It sure does help, Dave. Many thanks for your patience and forbearance in answering this radio newbie’s questions and helping me struggle along my learning curve. That’s what I like about your posts: you not only provide a detailed, technically-oriented answer that contributes to my theoretical knowledge, but also include the ‘short answer’ that helps me resolve the problem of the moment’. Thanks again. Just skimming here as I don’t have time today to read everything, but are you basically proposing a vertical dipole or a “ground plane”? Obviously length of the wire is critical. Finally got around to reading the whole thing. Much thanks. Very informative for the beginner to the extra alike. Will be doing this soon to my UV5R. 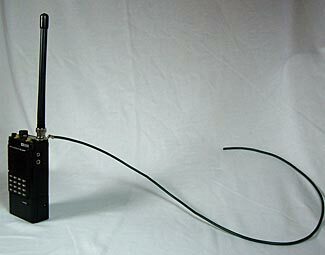 The 19.5″ wire for two meters should serve equally well in place of the 6.6″ one on 440 MHz. It’s three times longer and when it comes to antennas, they act much the same. It’s also why a forty-meter dipole will work on fifteen meters. When you’re willing to spend a bit more than 10 cents, replace that little rubber ducky antenna with a full-length one. For two meters, I find that a very flexible quarter-wave one is the most useful. It’s long enough to be effective, but not so long it gets in the way. Will this work for the old handheld CB radio’s as well? Yes, but it would need to be longer due to the longer wavelength of a CB radio (12 yards – 11 meters) as compared to the FRS/GRMS radios (28″ – 70 cm). So, not as practical. What about HT CB units? What length of wire for them? ‘Too long’ is the short answer (see the immediately preceding comment and response). It really only works well with the higher frequencies (and therefore shorter antennas). I recently bought the Baofeng BF-F8HP. Have you done this with this model and for how long? I am wondering about any long term side effects? I have heard that this could potentially harm the HT? There should be no damage to the radio at all and no ‘side effects’. With this extremely simply modification made a world of difference. I can now reliably use my HT on my fishing trips(or any other situation I may find myself in) where most repeaters I am able to bring up just hear noise from my end. I did this to my Baofeng UV-82L and have to say I’m impressed. When I bought the radio I purchased the Nagoya NA-771 antenna and have never used the factory supplied antenna. With that being said I have nothing to compare it to. I can say with a little bit of help on the receiving end from a friendly local ham, I was able to hit a repeater 25 miles away with full quieting. this is an extremely old trick. There used to be a company that sold these, nothing but a crimp ring a quarter wave (ar 2 meters) length of wire and a piece of heat shrink. Their commercial name was “Tiger Tail”. We would make them for the specific band of operation, even tuning the length with enameled magnet wire and a piece of fiberglass fishing rod to make an inductive load for the “tail”. for 11 meter use. With hand-held VHF/UHF transceivers, I get the most out of them by simply tossing the duckie and installing a homemade quarter-wave stub antenna mounted into a BNC connector. At such high frequencies, the bandwidth of a quarter-wave easily covers the entire authorized band., so no tuning or adjustment is ever needed. You can use a telescoping stub if you are worried about breakage; that makes the H-T pocket/holster portable. For a flexible stub I’ve been known to use a length of low-E guitar string. For handheld radios, nothing you can make or buy will beat this. I’ve played with 5/8th wave antennas but have seen no added benefit compared to the quarter-wave version. One last thing which can help in a pinch is grounding the HT’s case.